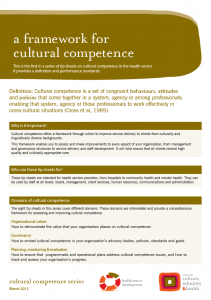 Cultural competence is a set of congruent behaviours, attitudes and policies that come together in a system, agency or among professionals; enabling that system, agency or those professionals to work effectively in cross-cultural situations. Cultural competence offers a framework through which to improve service delivery to clients from culturally and linguistically diverse backgrounds. This framework enables you to assess and make improvements to every aspect of your organisation, from management and governance structures to service delivery and staff development. It will help ensure that all clients receive high quality and culturally appropriate care. Who are these tip sheets for? These tip sheets are intended for health service providers, from hospitals to community health and mental health. They can be used by staff at all levels: board, management, client services, human resources, communications and administration. Cross TL, Bazron BJ, Dennis KW, Isaacs MR (1989) Towards a Culturally Competent System of Care Vol. 1. Georgetown University Child Development Centre, Washington DC. The Lewin Group, Inc. (2002) Indicators of Cultural Competence in Health Care Delivery Organisations: An Organisational Cultural Competence Assessment Profile Prepared under contract with the USA Department of Health and Human Services. NHMRC (2005) Cultural Competency in Health: A guide for policy, partnership and participation Australian Government, Canberra. The eight tip sheets in this series cover different domains. These domains are interrelated and provide a comprehensive framework for assessing and improving cultural competence. Organisational values: how to demonstrate the value that your organisation places on cultural competence. Governance: how to embed cultural competence in your organisation’s advisory bodies, policies, standards and goals. Planning, monitoring & evaluation: how to ensure that programmatic and operational plans address cultural competence issues, and how to track and assess your organisation’s progress. Communication: how to support the effective and culturally appropriate exchange of information between your organisation and its clients, and between staff members. Staff development: how to equip staff and service providers with the attitudes, knowledge and skills needed to deliver culturally competent services. Organisational infrastructure: how to identify and allocate the resources needed to plan, deliver and evaluate culturally competent services. Services & interventions: how to deliver or facilitate clinical, public health or health-related services in a culturally competent manner. This tip sheet lists issues that should be considered when conducting health assessments with clients from migrant and refugee backgrounds. a series of Help Sheets to assist Social Support Groups understand the different elements that support groups need to be culturally inclusive. In partnership with the AOD team at NRCH The Centre for Culture, Ethnicity & Health (CEH) will commemorate Sorry Day today with a ceremony in North Richmond.